Barnes & Noble released today its results for the last quarter, ending July 30, 2011. Although B&N's price went up almost 15% following the release of the quarterly report, I see in this report many signs that worry me, as they indicate the company is on its way to bankruptcy, just like Borders. 1. B&N doesn't have a strategy to transform its brick and mortar bookstores from a liability back into an asset and as a result sales continue to decline - "Revenue in stores open at least one year, a key indicator of a retailer's health, fell 1.6% at regular stores and 1.8% at college bookstores." (Reuters). 2. The Nook itself won't save the company - "Sales of the Nook group of devices, which includes a standalone as well as a touch-screen reader, rose 140 percent to $277 million in the quarter..Barnes & Noble Inc forecast sales of its Nook e-reader and e-books would more than double this fiscal year to $1.8 billion". 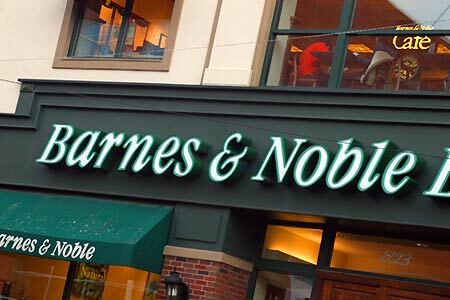 According to Reuters, "if the Nook and the e-books sales it generates live up to Barnes & Noble's expectations, they would account for a quarter of the chain's sales and all of its growth." Not only that putting all the bets only on the Nook is a risky move, but even if it will succeed the company still have 75% of business in trouble. The Nook itself just won't save the company, no matter how well it will perform. 3. B&N seems to think only about the short term, ignoring the long-term - "Barnes & Noble says it expects to get a lift in sales of $150 million to $200 million after Borders, which declared bankruptcy in February and said it would liquidate in July, completes liquidation sales and closes. "We're convinced this holiday will be the biggest traffic we've had in the stores over five years," Lynch said in a call with analysts." (USATODAY.com) - What will happen after this holiday season and after some Borders' customers will switch to B&N? Lynch has no answer. 4. The stores become a burden on BN.com - "revenue from the website rose 37%, driven by sales of Barnes & Noble's Nook Color and Nook Simple Touch Reader, and digital content." (USATODAY.com). The success of BN.com only demonstrates the weakness of B&N's brick and mortrar stores, which are still the core business of B&N. 5. When toys are your best idea to promote sales in stores you're in trouble - "While traditional physical book sales declined during the quarter, the stores posted large increases in sales of the NOOK product line and Toys & Games." Yet, the stores to remind you are still losing, which means that increasing toys sales do not compensate for declining books sales in the stores. Next idea, please. And finally, did I mention that there is no buyer to the company? If the picture is so rosy as CEO Lynch presents it, how come no one wants to buy the company and enjoy the fruits of the we-invest-only-in-the-Nook strategy? Maybe it's not as brilliant strategy as B&N wants us to believe? You can check our updates on Barnes and Noble Bankruptcy Index on our website. Eco-Libris: Plant a tree for every book you buy!